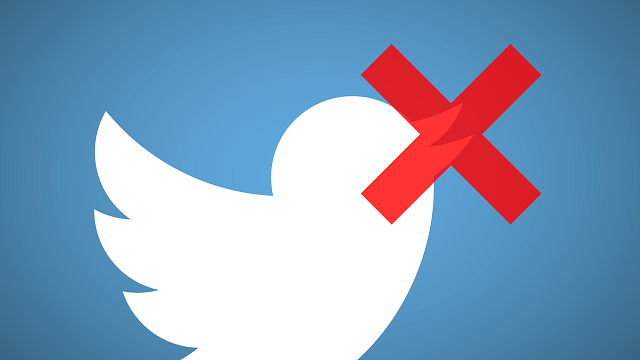 Although Congress has focused on Facebook's alleged censorship in recent weeks, Twitter continues to engage in mass bans of conservatives with little outside scrutiny. Increasingly, these bans come after users post "hate facts" -- statements that are factually true, but politically inconvenient for progressives. The most high-profile individual to be banned on this basis was Islam critic Tommy Robinson, who received a permanent ban from Twitter after he posted statistics showing that Muslims are vastly overrepresented in child grooming gangs in the U.K. Robinson is now taking Twitter to court to prove that "facts are now treated as hate." The censorship of British accounts is tied to increasing pressure from European governments for social media platforms to censor their users. Robinson claims that 10,000 Twitter accounts have been closed at the request of the U.K. government over alleged "hate." There are now concerns that the accounts of American users are also being shut down at the request of European governments. Nick Monroe, an independent journalist based in America, says he was banned from the platform after he began an investigation of Tell MAMA, an "anti-Islamophobia" organization based in the U.K. The Home Affairs Select Committee, made up of lawmakers from all British political parties, has previously pressured Twitter into suspending accounts accused of "Islamophobia" by Tell MAMA. Faith Matters, the group that runs Tell MAMA, has previously provided evidence to the committee, and has been referenced�during committee discussions of online "hate speech." Monroe says Twitter did not inform him of why his account was banned, nor highlight any particular rule-violating tweet. Breitbart News reached out to Twitter for comment -- a spokeswoman said�that the company "[doesn't] comment on individual accounts for privacy and security reasons." Monroe's account, which appeared to be permanently banned, was restored without explanation after Breitbart News reached out to Twitter for comment and after Monroe publicized the story on his blog. Even when European politics aren't involved, Twitter still punishes conservatives for making factual claims. 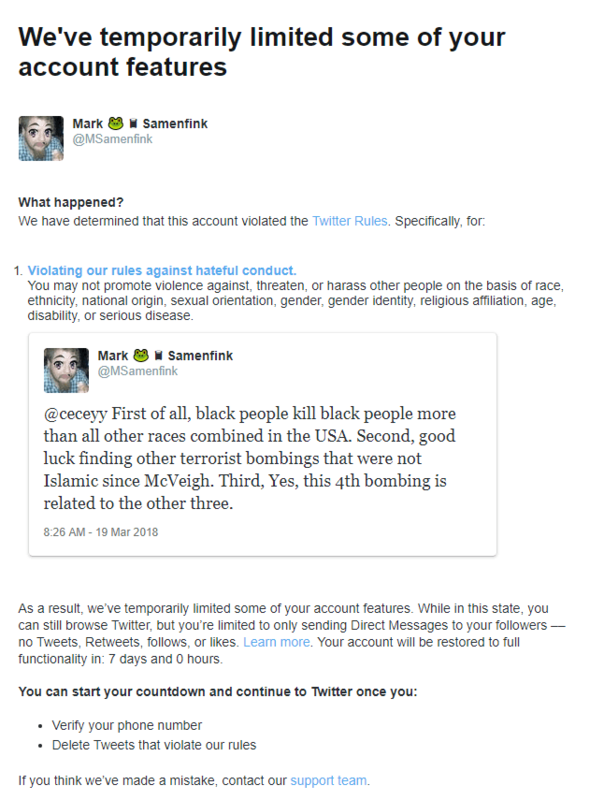 Conservative twitter user Mark Samenfink had his account locked after claiming that black-on-black homicide was more common than other types of homicide and implying that Islamic terror attacks were more common than non-Islamic terror attacks. Despite an appeal, Twitter refused to unlock Samenfink's account until the 7-day suspension period had expired.